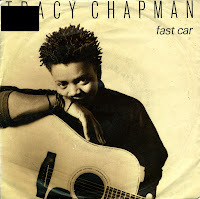 Tracy Chapman was born on March 30, 1964 in Cleveland, Ohio, where she was raised by her mother. In 1988, he made her debut with the single 'Fast car', a vivid tale of poverty that reached number 1 in Ireland and number 2 in the Dutch Top 40. While usually I don't understand why an artist has one hit as big as this and then virtually disappears from the world stage, in this case I do. Tracy Chapman appeared on the Nelson Mandela 70th Birthday tribute concert, doing her 'girl with guitar' thing, and the world was in raptures. But after two or three songs of a girl with a guitar, the fascination leaves as quickly as it comes. And so it did.